Metabolomics is the science of determining the metabolome of a biological sample. The metabolome is the collection of small organic molecules in a cell. It represents the collection of all metabolites in a biological cell, tissue, organ or organism, which are the end products of cellular processes. Metabolomics integrates the history of the combined genetic and environmental influences on the metabolism of that sample. By comparing the metabolomes of samples, one is able to gain insights as to the genetic, environmental and developmental modulators that distinguish the samples. It helps scientists study how plant genes contribute to producing various chemical compounds, some of which are medicinally important. Most people know that some medicines come from plants. Foxglove gives us the cardiac muscle stimulant digoxin. 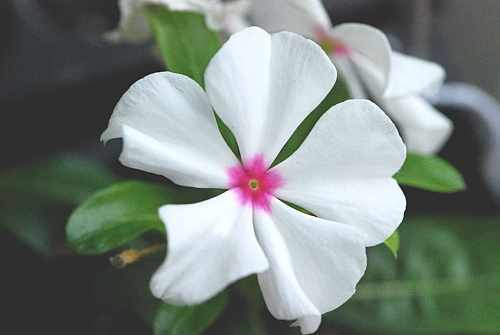 The periwinkle plant (image)offers a source of vincristine and vinblastine, a chemotherapy drug. Plants and its compounds have a lot of potential in medical and medicinal applications. Natural products from plants serve as rich resources for drug development.It has a profound and lasting impact on human health and include compounds successfully used for decades such as digitalis, Taxol, vincristine, and morphine isolated from foxglove, periwinkle, yew, and opium poppy, respectively. The enormous structural diversity and biological activities of plant-derived compounds suggest that additional, medicinally relevant compounds remain to be discovered in plants. While plant natural products continue to be a prime target for drug development, the clinical potential of these compounds is often curtailed due to low production levels in plant species. The drug Taxol almost stopped production because the primary source, yew tree bark, could not be used as a sustainable source of the drug. In this particular instance, a Taxol precursor happened to be more readily available in a renewable part of the tree, and a semi-synthetic protocol could be developed to convert it into the drug. While fortuitous, more generalized solutions, such as metabolic engineering of effective plant and microbial production platforms, are urgently needed to ensure that the wealth of bioactive compounds found in plants enter the clinical pipeline and find widespread use in medicine. Scientists released the data they have so far on the genetic blueprint of medicinal plants and what beneficial properties are encoded by the genes identified. The released resources is a $6 million initiative to study the genetic blueprints of medicinal plants. "Our major goal has been to capture the genetic blueprints of medicinal plants for the advancement of drug discovery and development," said Joe Chappell, professor of plant biochemistry in the University of Kentucky College of Agriculture and coordinator for the Medicinal Plant Consortium (MPC). Project partner Dr Sarah O'Connor at the John Innes Centre will now work with her research group towards the first full genetic sequence of a medicinal plant and will also experiment with combining beneficial properties from different plants to create the first new-to-nature compounds derived from plants. A priority focus will be compounds with anticancer activity. "Fewer and fewer new drugs have been successfully making it to the marketplace over the last 10 years, in large part because of a reliance on chemical synthesis for making new chemicals," said Chappell. "Somehow in our fast-track lives, we forgot to take advantage of the lessons provided by Mother Nature. That is all changing now with the recognition that two-thirds of all currently prescribed drugs can be traced back to natural sources and the development of resources such as those in the MPC to facilitate new drug discovery activities." The John Innes Centre is a world-leading research centre based on the Norwich Research Park. The JIC's mission is to generate knowledge of plants and microbes through innovative research, to train scientists for the future, and to apply its knowledge to benefit agriculture, human health and well-being, and the environment. JIC delivers world class bioscience outcomes leading to wealth and job creation, and generating high returns for the UK economy. JIC is one of eight institutes that receive strategic funding from the Biotechnology and Biological Sciences Research Council and received a total of £28.4M investment in 2010-11.